There is no more spectacular place to watch whales in California than Dana Point. You can watch whales almost anywhere along the California coast, any time of year and you may be wondering what makes Dana Point more special than other locations. Southern California has the largest concentration of blue whales in the world. You can see them seasonally along the Orange County coast, along with migrating gray whales. Any time of year, you might also see a fin whale, a humpback, a minke whale, or a pod of orcas. According to experts, gray whales breach - that's the spectacular jump-out-of-the-water and make a big splash move - more often near Dana Point and Laguna Beach than in other parts of the coast. That's another reason to make the trip to Dana Point if you can. But here's the really big thing: Dana Point is famous for sightings of dolphins by the thousands. In fact, the area has more dolphins per square mile than anywhere else. They (and those amazing whales) are the subject of jaw-dropping videos. Blue whale season is May through November. Gray Whales show up from November through April. 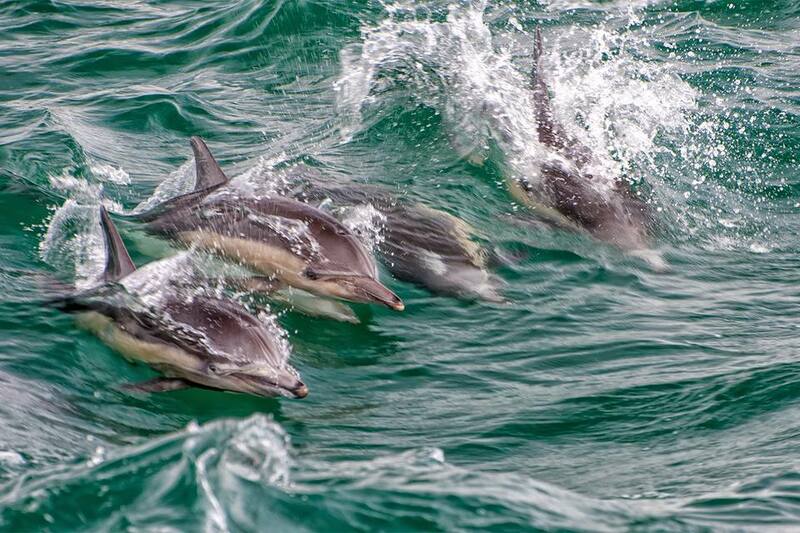 The big pods of dolphins often seen at Dana Point are around all year long. So are the sea lions, making for a high probability of seeing a marine animal no matter when you go. The annual Dana Point Festival of Whales occurs in March, with so much to do that it stretches over two weekends. Dana Point is the best spot for whale watching in the OC. It's easy to know that from the enthusiastic reviews from people watched whales from there. That could be because of Dana Point's two-mile-wide, east-west facing coastline. It draws the whales and dolphins closer to the shore. But whatever the reason, Dana Point is the place to go for a fun whale watching experience. Captain Dave's is a very highly rated whale watch operator in Dana Point. They have the best-equipped boats (and the best guest reviews) in all of California. Their catamaran is equipped with underwater hydrophones so you can hear the animals' calls. Captain Dave also has underwater viewing pods that can bring you eye to eye with those amazing creatures, without getting wet. The experience is so good that it prompted the local CBS television affiliate to exclaim: "…this tour offers the best whale watching in the world!" You can also watch your whales with Dana Wharf Fishing and Whale Watching, a locally owned company with decades of experience. You can also have fun on a whale watch from Newport Beach if that's more convenient. Whale watching tours in Newport Beach include Davey's Locker and Ocean Explorer Cruises. Newport Landing offers whale watching cruises from the Balboa Fun Zone. The best place to watch whales from land near Dana Point is from the trail along the headlands near the marina, but it's not the only place you can try. Whale watching trips are somewhat expensive. You may be tempted to go for the lowest price, but that could be a mistake. If you're looking for that trip of a lifetime, your whale watch may not be the time to go bargain-shopping. If you're looking for a whale watching discount, you may find one using online services like Groupon. But beware. ​Lots of online whale-watching reviews that include complaints talk about hidden costs and poor quality. In fact, the poorer the quality of the trip, the more likely you are to find a discount.